It's time to look ahead to the pretties coming out this year. You all know my penchant for fairy tales retold. Having recently come off the high of Marissa Meyer's Scarlet, I find myself eager to dive into a few more upcoming retellings. As luck would have it, there are several on the horizon. Here are three that look especially nice. Which one catches your fancy? I have been waiting for a solid Bluebeard retelling for some time now. In fact, if you've read a good one, do let me know. This one has the look of one I'm gonna enjoy. Girl moves to a manor house in the deep south to live with her mysterious guardian. The usual terror ensues. My fingers are crossed. I enjoyed the liberties Ms. Jay took with the well-worn Romeo & Juliet tale. So I am perfectly willing to give her a chance with my beloved Beauty & the Beast. This one involves a blind princess, a desert monster, and a prisoner who steals a rose. Let's do this thing. The latest from a fairy tale afficionado. I enjoyed Ms. Flinn's Beastly very much, though I haven't read the rest of her retellings. This one, as far as I can tell, is a modern Rapunzel. I have yet to read that particular combo (though I am certainly looking forward to Meyer's take in Cress). But since that one is so far away, I think I'll start here. I am insanely in love with the Towering cover and the title of the Bluebeard retelling. I mean, GORGE! And I have a confession: I will read anything BatB related, though I like Jay's work anyway, so it was definitely happening. I will, too. I cannot resist the potential of a new BatB retelling. What's your favorite of Jay's work? 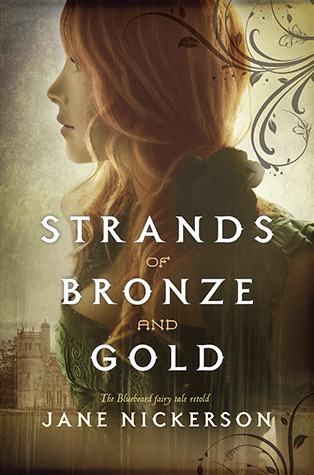 I love the cover of Strands of Bronze & Gold. It looks ethereal and mysterious. I'm going to be reading my ARC of it soon and am really looking forward to it. 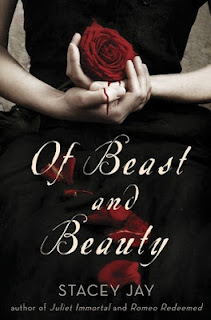 I hadn't heard of the beauty and the beast retelling but that's definitely going on my to-read list for sure! Ooh, you already have one. Definitely looking forward to your thoughts! Oh, MUST HAVE Of Beast and Beauty. *adds to wishlist*. Beauty and the Beast retellings are my Kryptonite. I hereby publicly damn you as I add these to my wish list. I dangle pretties because I love, Laura. I can't say I enjoyed Flinn's Beastly, so I probably won't go for that third pick, but I have to say that I'm so glad we're still seeing new fairy tale retellings. Love those. Isn't it reassuring? I worry sometimes they'll all go away and new ones won't come down the pipeline. I'm happy to be wrong. Ah, so many fabulous retellings are coming out this year (fairy tale and otherwise). I love the covers for these too! I think I'll definitely have to refresh myself on the Bluebeard tale before I read Strands. Yeah, that one's more obscure but with so much potential . . .
Also, happy (belated) new year! Doesn't it?! I really have been waiting for a good one. It deserves it. Oh gosh--all three go right on my wish list! I am definitely eager for Strands of Bronze and Gold. Yeah, that one's just calling my name. I love, love, love retellings too! Fairy tales, folklore, myths and more! I'm always on the lookout for new ones. I am eagerly awaiting Strands of Bronze and Gold. 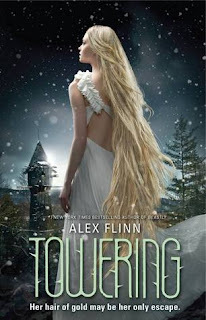 I am not a fan of Alex Flinn or Beastly, so I'm not sure about Towering. But Of Beast and Beauty looks interesting (and it's my favorite fairy tale)! Hear, hear. It's my favorite as well. Which B&B retellings are your favorite? I have all of these three retellings on my wishlist as well, Angie, and I too hope they will be as excellent as Cinder was. Stung by Bethany Wiggins(Sleeping Beauty) - This one I have to say sounds like it has the potential of being an awesome read. Awesome, Mari. STUNG recently came across my radar and I am very much looking forward to it. What a great premise. And thanks for the heads up on NAMELESS! I'm a huge fan of fairytale retellings myself! I am very excited for all three. And I can't wait to read Scarlet!!!! Oh, you will not be disappointed in SCARLET. I just loved it. Oohm, adding Strands of Bronze and Gold to the TBR. It sounds lovely. Doesn't it? I'm digging the look of it. I haven't read any Alex Flinn yet myself, and I really ought to. I think I'm having that 'oh she's popular so she can't possibly be good' reaction which is a bit of a silly reason not to try something. The other two I'm VERY excited about. PLEASE let this be a solid Bluebeard retelling--it has so much potential! I too, loved what Jay did with R&J, so my hopes are high for B&tB. I thought there were some interesting things going on in BEASTLY. I know a lot of people didn't like it, but I liked the ways in which she played around with the fairy tale. It was also, at times, dead funny. I read "Cinder" over the Christmas break and I'm looking forward to "Scarlet". Thanks for the great suggestions! Nice timing, Chrissy! It'll be out soon. Be sure to let me know what you think when you do read it. I just smile whenever I think about it. Have you read The Bloody Chamber by Angela Carter? It's a bunch of short stories inspired by fairy tales. Very interesting read! Her adaptation of Little Red Riding Hood is one of my favorites and I think other adaptations are always lacking. That is probably my favorite fairy tale. Also, one of the stores was adapted into a film called In the Company of Wolves. Emilia, I have not. I've sort of flirted with reading it for awhile now, but never actually followed through. I'm really happy to get your recommendation for it now. Particularly the LRR story. I adore really well done retellings of that one.